Where have the last 10 years gone? 10 years ago today I was sat on a rather lovely boat called Alpha Beta, bobbing around off the coast of the Isle of Mull. Fresh out of university I was spending the summer working as a volunteer for Sea Life Surveys, one of the longest running whale watch companies in the UK. This particular day was my day off, but that had not stopped me hopping on board for a couple of whale watches, off in search mainly of minke whales but with a range of whale and dolphins species, seals, basking sharks and a multitude of seabirds to encounter. I remember this particular trip more than any other. It was a rather cloudy day but the sea was reasonably calm. We’d done one trip and had headed out for a second. Sitting on the top of Alpha Beta, her broad white bow in front of me, dipping and rising a little with the waves I had gazed out at the silvery grey sea and the surrounding landscape that was quickly becoming very familiar to me. The Isle of Mull stretched out to my left, to my right in the distance the low lying island of Coll hovered on the horizon. Ahead the rugged coastline of Ardnamurchan, with its impressive lighthouse towering into the grey clouds. 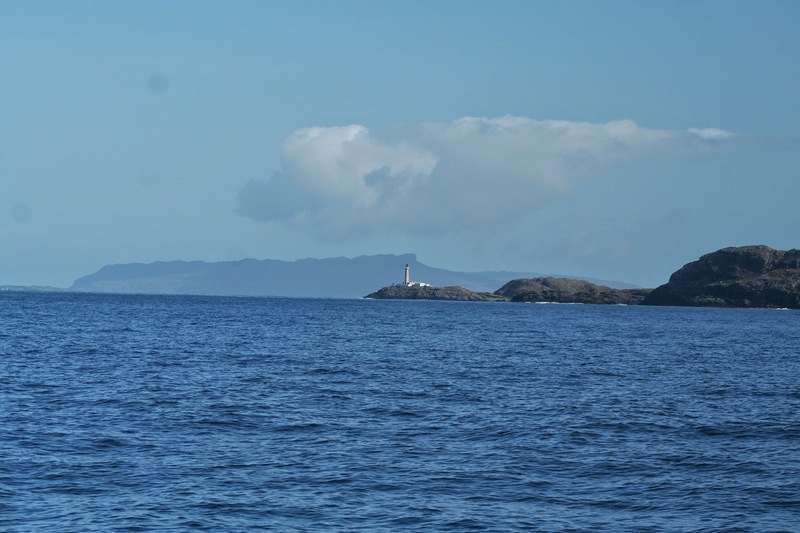 Beyond that I could still see the characteristic outline of the Small Isles, in particular Rum and Eigg (which always reminded me of a humpback whale). We were heading in, having encountered a good number of birds, and a couple of minke whales, one of which had surfaced just in front of the boat so that I could almost see down its blowholes as it surfaced, breathed and dived. It had been a good trip. Eri, who was guiding had kept the passengers engaged, all I had to do was sit back and enjoy. It was just as we were approaching the entrance to the Sound of Mull that one of the passengers commented that he thought is saw something, way over towards the Small Isles. I looked over, scanned, and something caught my eye. Something that at first did not really register. A tall, black, vertical ‘thing’ had risen out of the grey waves before disappearing. I spoke with the skipper. There was… something there… So we turned and all eyes were trained on the spot. Once again that something surfaced, only this time there was no doubting what it was. Orca! We slowed and let them approach. Thus began my very first encounter with Orca. Not just in the UK but anywhere. Not only that but they were members of the West Coast Community, the only resident group of Orca in the UK, and with only nine members (possibly eight) and no calves in years, also the most endangered. I watched spell bound as six whales approached, two with really tall dorsal fins. Most likely Aquarius and Comet, two of the males in the group, accompanied by females, likely to be Puffin and Occasus who usually travel with Comet and Aquarius respectively, although I cannot tell from my photos. 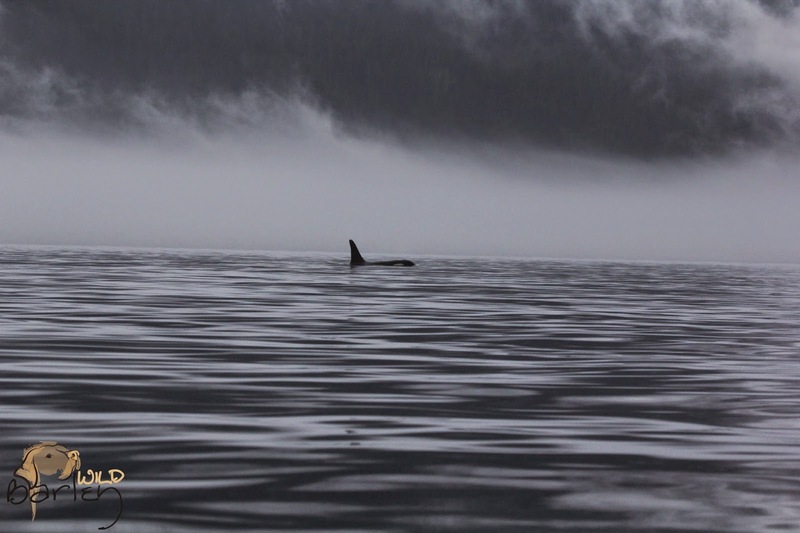 Behind these came a very distinctive male called Floppy Fin, one of a very small percentage of wild Orca that have a bent over dorsal fin. Again a female travelled close to him, one I could not ID from my pictures but could have been Nicola, a female who is regularly seen with Floppy Fin and suspected to be his mother. In total there were six of them, moving at a steady pace, passing us and heading down the coast. I remember seeing Floppy Fin and the female tail slapping and milling around before also heading away. 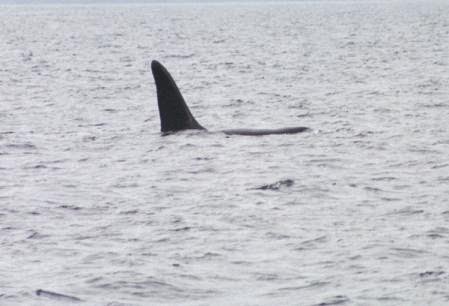 In the intervening years I have been lucky enough to see Orca again, and they have been very special encounters each of them; every sighting of wild Orca is. Standing on a cold, windy deck of a ferry crossing the Bay of Biscay, with a guy who just came up to have an early morning coffee and was treated to me jumping around the deck in excitement as four Orca passed quickly by. Watching a male and female through a telescope from a beach in New Zealand, not quite believing my partner at first when he said ‘I’ve got Orca!’ Two Orca filled weeks in Canada that began with watching transients hunting seals and culminated in a spectacular encounter in a kayak with Northern Residents appearing out of the mist. Three individuals cruising out of Force 8 waves north of Norway, and then a group of nine calmly surfacing in silky blue, calm waters on the journey south with one huge male breaching clear of the water parallel to the ship, much to the delight of all on deck. All have been memorable and special, but I will always remember that very first sighting, 10 years ago today in a very special place with a crew of very special people. A part of my heart remains in Mull and with the West Coast Community of Orca, who inevitably will one day no longer patrol the waters of the west coast of Scotland and down through Irish waters. Perhaps before that time I will catch up with them again, and maybe even get the chance to meet John Coe, the most recognisable and well known of the community. But if not I am privileged and proud to have encountered them once all those years ago. 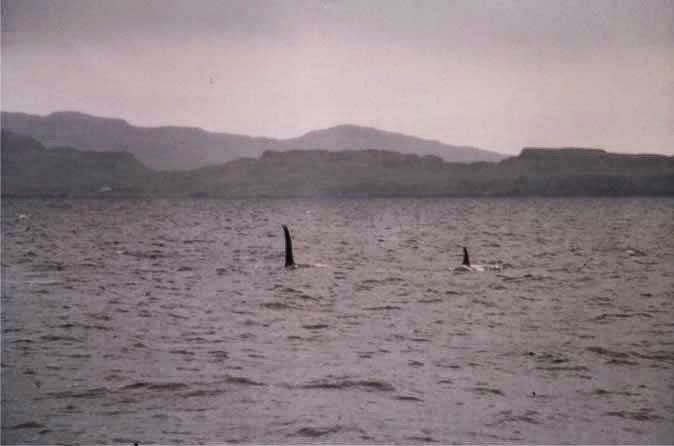 Find out more about the West Coast Community of Orca at the Scottish Orca blog or the HWDT website. And why not go whale watching with Sea Life Surveys, one of the best whale watch companies not only in the UK but in the world!